Oil and gas investment in Norway is expected to grow for a second year in a row in 2019 but will fall back between 2020 and 2023, an industry lobby group said on Monday. Western Europe's largest oil producer has seen a recovery in oil industry activity thanks to higher crude prices, after a slump in 2014-2016. 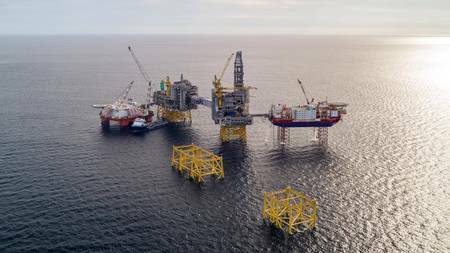 Investment in Norway's oil industry is estimated to rise by 16 percent year-on-year to 184.5 billion crowns ($21.5 billion), the Norwegian Oil and Gas Association (NOG) said. It previously expected 2019 investment of 153 billion crowns. "It is good news that activity is so high on the Norwegian continental shelf. We believe this is because of the significant restructuring the industry has done in recent years, which has increased competitiveness," the lobby said in a statement. NOG head Karl Eirik Schjoett-Pedersen said the price fall was not expected to have a major impact. "We think the projects are quite robust, because the companies have been focused to make them economic at even lower oil prices," he said. Norway's Equinor said its new projects had an average break-even price of $21 a barrel, while Aker BP said it would not invest in projects with break-even price higher than $30 a barrel. "I'm very concerned about the need to focus on the costs," Schjoett-Pedersen said. NOG said exploration spending was expected to rise to 30 billion crowns in 2019 from 26 billion in 2018, although the number of wells being drilled was not expected to change from last year's 56.